ONE FREE USB PORT TO CONTROL UP TO 3 STEPPER MOTORS. INCLUDES 4 ANALOGUE AXLES. 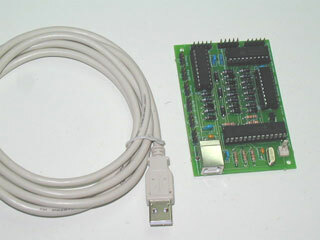 USB-STEPPER MANAGES UP TO 3 STEPPER MOTORS (SINGLE OR DUAL POLE TYPES) 1 AMPERE PER CORE AND 24 VOLTS. INCLUDES 4 ANALOGUE AXLES WHERE TO CONNECT POTENTIOMETRES (RESOLUTION OF 8 BITS; 255POSITIONS). THE CARD IS CONFIGURED TO BE USED BY IOCP PROTOCOL, WE CAN PROGRAM IT WITH A HIGH LEVEL LANGUAGE OR WITH SIOC. CONTROLLER RECEIVES SIGNALS FROM 3 POSITION SENSORS FOR CALIBRATION PURPOSES. CARD RECEIVES POSITION (0-359 DEGREES) AND SPEED INFORMATION AND CALCULATIONS ARE MADE AUTOMATICALLY. MOTORS FROM OLD PRINTERS, FLOPPY DISCS READERS, ETC. CAN BE USED. TO BUILD ANALOGUE GAUGES WITH CONTINUOUS MOVEMENTS LIKE ALTIMETRE, COMPASS, ETC.